There is a $500.00 non-refundable application fee. A single application fee is charged, no matter how many programs an organization is seeking to have accredited. The cost of the accreditation survey depends upon the size and complexity of the program being accredited. The cost is $2,000.00 per surveyor per day. There is a $1,000.00 annual fee to maintain accreditation. This fee is not charged during the initial year that accreditation is granted. It is due one year following the awarding of accreditation and again the next year. A single annual fee is charged, no matter how many programs within the organization have received NADD accreditation. 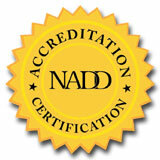 The NADD Program Accreditation is good for up to three years. After the initial accreditation period, accredited programs are required to have at least ten (10%) percent of their clinical, specialist, and direct support staff certified through the NADD Competency-Based Clinical Certification Program, the NADD Competency-Based Dual Diagnosis Specialist Certification Program, and the NADD Competency-Based Direct Support Professional Certification Program. This can represent an additional cost. In an effort to control the cost of accreditation, NADD offers discounts on certification of personnel who work at an accredited program. The normal cost of clinical certification is $375 for a two year certification, with renewal costing $100. For clinicians who work for an accredited program, the cost is $250, with renewal costing $65. The normal cost of Dual Diagnosis Specialist Certification is $275 for a two year certification, with renewal costing $75. For specialists who work for an accredited program, the cost is $200, with renewal costing $50. NADD Competency-Based Direct Support Professional Certification normally costs $60 for a two year certification, with renewal costing $30. The cost for DSPs who work for an accredited program is $30, with renewal costing $15.